For many gardeners, at the first sign of bugs on their garden plants, they reach for an insect killing spray. That is the wrong approach. Never mind what that does to the environment and your health, poisons don't discriminate. When a gardener applies an insecticide, there are actually "good bugs" in the garden that are killed along with the problem insects. If you are new to the idea of beneficial insects, let me give you an example. 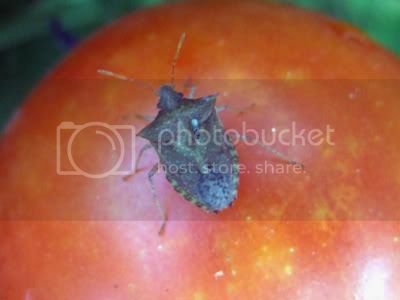 If you saw the bug in the below picture on one of your tomatoes, would you want to destroy it? You shouldn't. That is a Spined Soldier Bug and he is a soldier in the gardener's army. The Soldier is beneficial because it eats aphids, armyworms, beetles, cabbage loopers and other soft-bodied insects. The Soldier Beetle is so beneficial that there was a big article in Organic Gardening Magazine about how to trap them in the wild for the purpose of releasing them in your garden. Surely that ugly thing needs to be killed, you might be thinking. There is more in this picture than meets the eye. This insect is a very destructive Tomato Hornworm, but look closer. What about the little white cocoons attached to it? These are Braconid wasp cocoons. Braconid Wasps are parasitic. 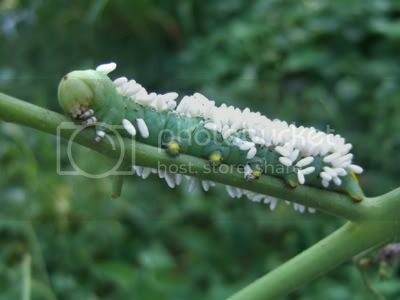 They live in the Hornworm (which is actually a caterpillar) as larvae, and then make cocoons on the outside to pupate. The adult wasps emerge, kill the caterpillar and fly off to find more caterpillars to destroy. See, who needs chemical insecticides to control caterpillars? Nature has it covered - unless you kill the braconid wasps with chemicals first. Attract beneficial insects to your garden by using Benafeed! We emptied the whole jar back out in the garden. I counted over 300 cocoons on this hornworm! If only half of them find a new caterpillar to invade, I soon won't have any caterpillar problems at all. No need for chemicals - nature can take care of things if we let it. There are even smaller parasitic wasps out there. Arbico-Organics is a store that sells organic and natural fertilizers and pesticides. They sell Trichogramma wasps for you to introduce into your garden to do a similar thing that my Braconids are doing - especially to get rid of moths. The Trichogramma wasps are almost microscopic! These are just a few examples of beneficial insects. Depending on where you live, you will encounter different ones. 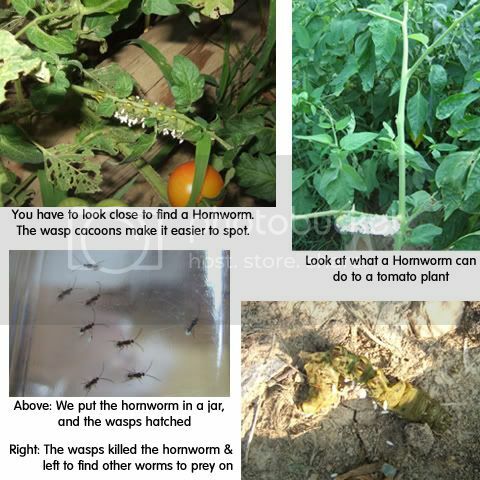 When you find an insect in your garden, do some local research to determine if it is good or bad. If there is plant damage near by, don't assume that the creature you found is the culprit. It might be there to feed on the actual pest! Other beneficial insects that I have discovered in my garden are ladybugs, lacewings, praying mantids, and bees. The bottom line is this: If you spray insecticide at all, you won't have any beneficial insects to help you. When the pest insects come back, they will inflict even more damage because of the absence of beneficials. Gardeners and farmers who use chemicals force themselves into a never-ending cycle. They continue to have to spend money to temporarily solve their pest problems in an unsafe and harmful way. I think nature's way is better. Sometimes I may have to wait on the beneficials, hand pick pest bugs, and even lose a few crops, but I like watching nature work. It keeps gardening a fascinating endeavor instead of a divide and conquer campaign. Knowing that I'm participating with nature instead of destroying it, makes makes me feel good. Many easy to grow annual flowers do well in the vegetable garden. They add visual appeal, attract pollinators but actually chase away or confuse some other insect pests. Companion planting with marigolds is the most popular and perhaps the most effective. Marigolds deter or actually kill the root knot nematodes that live in the soil and can attack the roots of your plants. Marigolds also help keep away insects that you can see above ground. Plant them with beans to deter the Mexican Bean Beetle, with squash to confuse squash bugs, and anywhere to combat thrips, white flies, horn worms and probably others. Grow Nasturtiums up a trellis alongside your beans or cucumbers for added color and to deter bugs as well. They are supposed to help with the Colorado Potato Beetle among others. Nasturtium flowers can also be eaten in salads! Sunflowers look great as an edging on the north side of the vegetable patch and can add a windbreak if you get high winds where your vegetables are. Any other annuals will also add beauty to your veggie patch from their blooms and from attracting butterflies. What made me think about planting flowers in our garden this year was that we visited a butterfly show yesterday. The butterflies were beautiful but the flowers were equally as pretty. Most of them were annuals that are easy to grow. So I'll leave you with some pictures we took from the butterfly exhibit. So consider adding marigolds or other annual flowers to your vegetable garden, and maybe you'll get butterflies too!